The shower-beer is evidence of a day well-lived. Whatever you’ve been doing has led to this moment. You’re tired, dirty, sweaty, perhaps chilled from time spent outdoors; and now the steaming hot water is running over your neck and shoulders while you gulp down a cold beer. Life doesn’t get much better than this. Shower-beer, you complete me! Many of you know of what I speak. There is something truly magical about a shower-beer. This isn’t your average morning shower before work – get in, get clean, get out. Oh no! This is the kind of shower you’ve earned. It’s like a balm for your worn-out body as the hot water does its job on the outside, while the cold beer makes you whole again from the inside. Aaaaahhhhhh!!!! 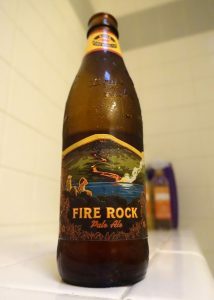 If you’re wondering why I’m bothering to write an article on beer consumed in the shower, you’ve probably never had one. Am I right? 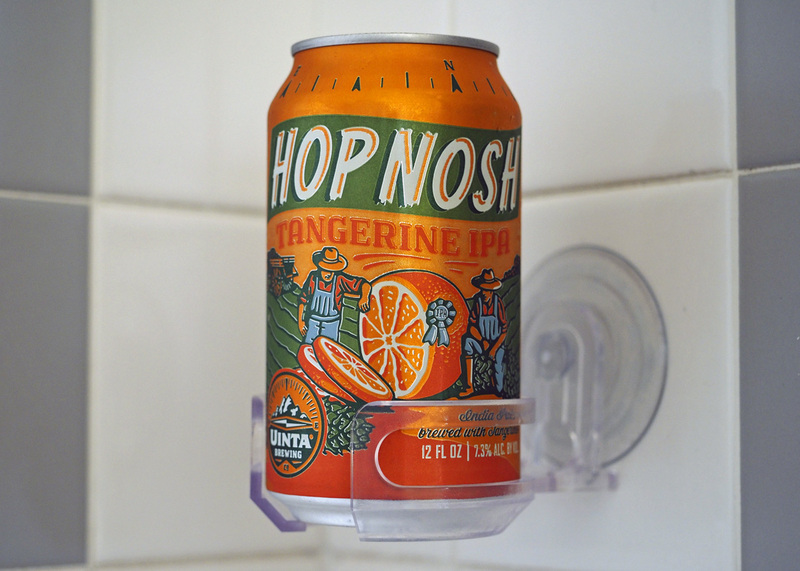 Your assignment is to shower-beer it up at the next possible opportunity. You’ll know when that is. Whether you’ve been out having fun or working hard, the shower will be calling and so will the cold beer. You may be thinking, hmmm, which shall I do first? The answer is: both! Choose a refreshing cold beer. Part of the joy of a shower-beer is the contrast between the cold beer and the hot shower. I like something with a lighter body that is best enjoyed at a lower temperature. I’m not sipping, I’m swigging. But, whatever you like to drink will do just fine. It’s your shower-beer! Choose a can over glass. Safety first! I’ve enjoyed many a bottle of beer in the shower with no mishaps, but I’d just as soon not worry about what would happen if I dropped my beverage. You’ve got soap happening along with wet hands and bare feet. A can is just easier to deal with. A bathtub-beer will give you a little more leeway. It’s quite safe to pour your beer into a proper glass when you’re reclining in a tub. Worst case scenario, you end up bathing in beer. I can think of worse things. Find a place to set your beer. Every shower is different. The best place to set your beer down while you shower is somewhere stable and out of the water stream. If your shower has large shelves or ledges with plenty of free space, you won’t have an issue. Be careful with built-in soap dishes. Setting a beer there is often precarious. A small shower with little space can be tricky, but I have a solution for that. Buy a SipCaddy! 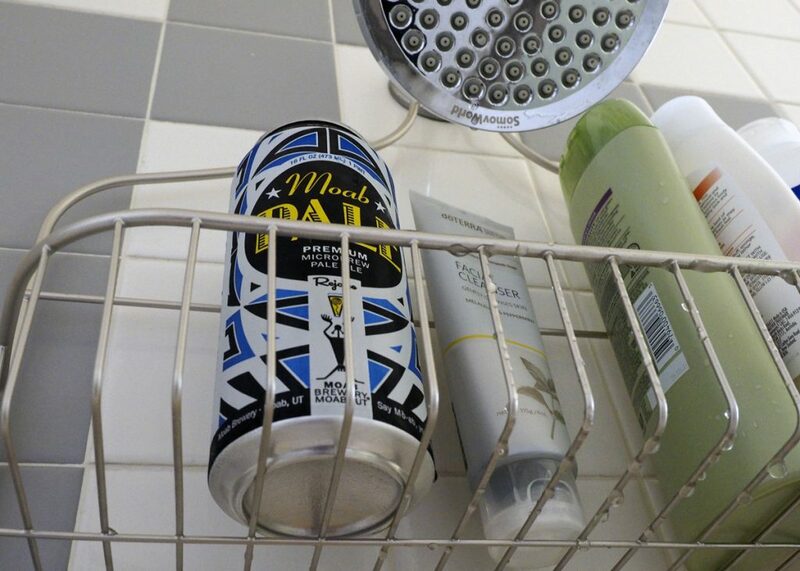 This simple and affordable contraption will allow you to pinpoint the ideal location for your shower-beer in any bath or shower. It firmly holds a can, bottle, cup, or even a wine glass. The suction cup is very strong and will work well on smooth, tiled walls. If your shower has porous surfaces, a suction cup might not work. You may need to utilize your shower caddy and find a spot next to the shampoo or bodywash. However you shower-beer, I hope in means you’ve had great day that ended in the best possible way.